Lake Garda offers a surprising variety of scenery. Along it’s shores grow vigorously fauna which is typical of the Mediterranean. Amongst the greens, are terraces of lemon trees, the silver reflections of the olive trees and the whites and reds of the vines from which come great wines such as Bardolino. 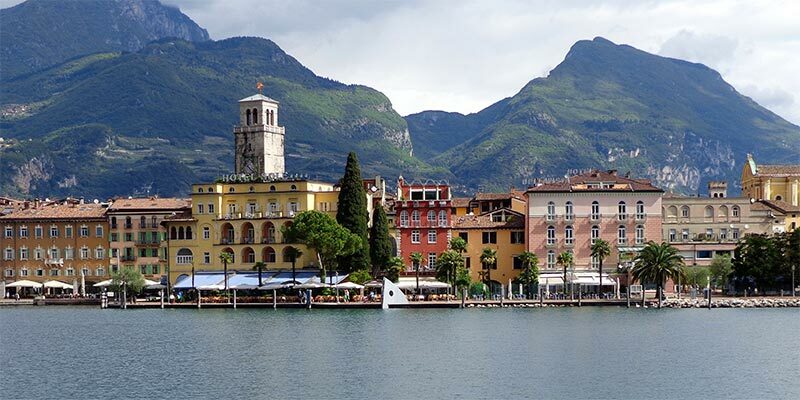 The romantic hamlets that were the itinerary of famous poets and painters over the centuries which lay between the Lake and the Alpen backdrop all along the gracious winding shores of Garda. If you’d like more detail, please consult the next few paragraphs. Located on the east coast of Garda, between the lake and the morainic hills. The area is famous for it’s red wine and it’s olive oil. On the outskirts, Bardolino has even dedicated a much frequented museum to the traditions of it’s oil production. In the center, you may visit a castle with it’s 1,000 plus years of history and then wander along the narrow streets which wind between the main road and the lake. Bustling tourist town just fifteen minutes drive north of the hotel, Malcesine is famous above all for it’s perhaps 1,000 year old castle high on a promontory. Within a short walking distance lies the Captains’ Palace which today is the Town Hall but was once the Venice Republic’s seat of local control over the lake. Below this building lays a romantic route of twisting walkways full of interesting shops and coffee bars. From Malcesine departs the Cablecar that travels up to Mount Baldo offering a magnificent view of the lake. 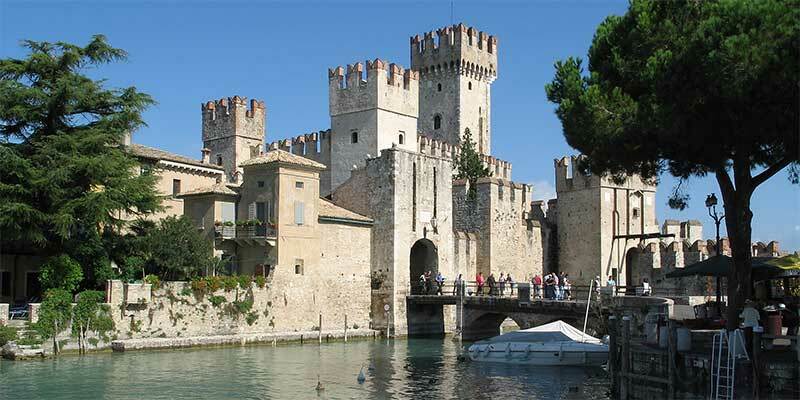 Sirmione’s Scaligero Castle seems to emerge from the waters of the lake. The town is considered to be one of the most romantic spots on the lake with narrow streets winding around it’s medieval center. At the point of it’s peninsula lays the remains of the Roman Villa la Grotte di Catullo. Do you have a few hours to dedicate to a total relax? 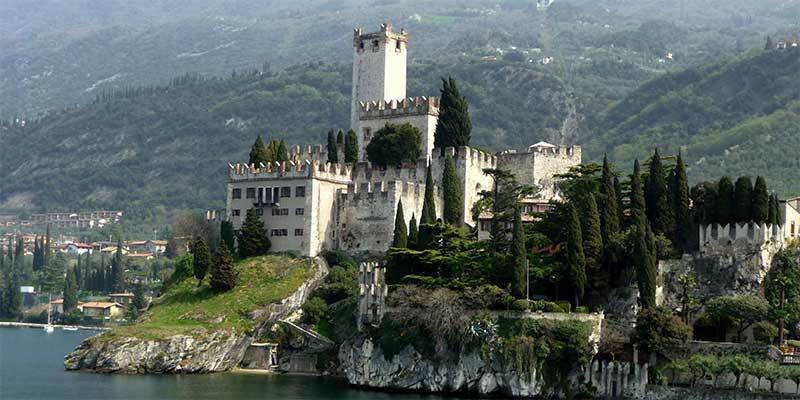 Then consider going to the Wellness Center to enjoy the curing thermal waters of Sirmione. Right at the very northern tip lays the town of Riva del Garda. Here the Alps begin to slope towards the lake steeply leaving Riva as one of the very few flat spots where one can access the coast. Riva and Torbole is World famous for surf with a constant wind generated by the exchange of currents coming down from the Alps as it meets the warm lake. As well as water sport, the town offers many shopping opportunities and gentle walks.